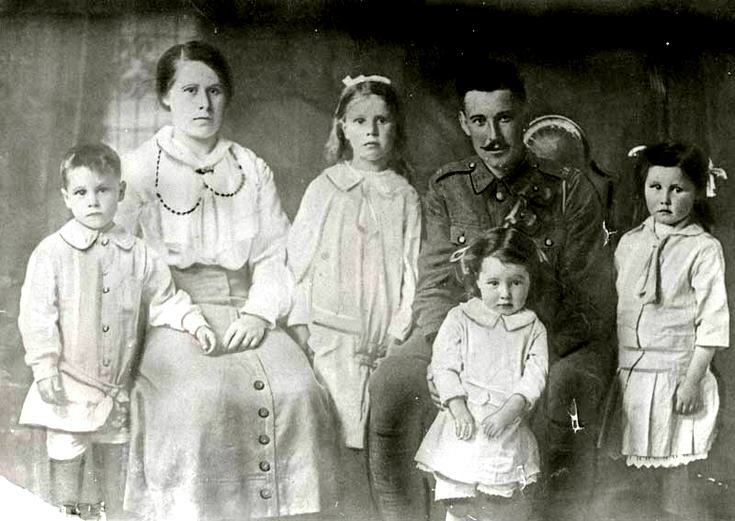 This photograph is of James Third (Royal Field Artillery) born 1891 at Mains of Tarty, Georgina Margaret McIntosh Third (nee Lumsden) and their four children in c1918. Their children are John 1912, Jemima 1910 (McAskill), Jeannie 1911 (Tucker), and Elizabeth 1913 (Tucker). All children were born in Alford and all except Jemima came to New Zealand in 1921. Apparently the farm house they lived in was still standing a number of years ago, but without a roof. My Father was born Simpson Third in Alford Aberdeen in 1911. Could this possibly be some relatives??? That must be dad's uncle ????? Yes that is correct exact DOB -his father was William and mother was Catherine, so where do you live cousin. I know there was another family too as his father William married the sister when his wife died., and his half brother was called Lesley one of them anyway-he also had brothers called Peter-Teddy- sisters Annabelle- Lizzie ones I can remember offhand, does that relate to you? Hi Trish, yes it all ties up to the same family. Its a complete coicidence as I was in the Royal Scots Museum in Edinburgh checking on the Service record of Simpson 2 weeks ago.I have a family tree for the Thirds from the 1700s. I was in Alford in May of this year trying to find any Third's looked through the graveyard also nothing.Dad (Simpson)was bar manager at the Scotland Hotel in Pitlochray, meet mum and had me in Aberfeldy hospital 1949 we lived in and around Pitlochray-would love to see the info you have collected on the family-also what clan we come under someone told me it relates back to the mother maiden name.dad was also a prisoner of war in a japanese camp for 5yrs I believe. there is too much information to put it on here. My e'mail is- l.third@btinternet.com I live about 22 miles from Pitlochry.The Thirds belong to the Gordon Clan.I believe your father was in the Gordon Highlanders and transferred to the Royal Scots and was taken prisioner at Hong Kong.Waiting your reply.